Shopping for Dragon Age Games? Six dice from Thedas! Within this box you'll find 6 beautiful dice, emblazoned with iconography from the world of Thedas, setting for BioWare's Dragon Age fantasy video game! Four of these high-quality, durable dice carry the symbols of the Circle of Magic and the Templars. The remaining 2 bear the Grey Warden Griffon and the iconic Blood Dragon. 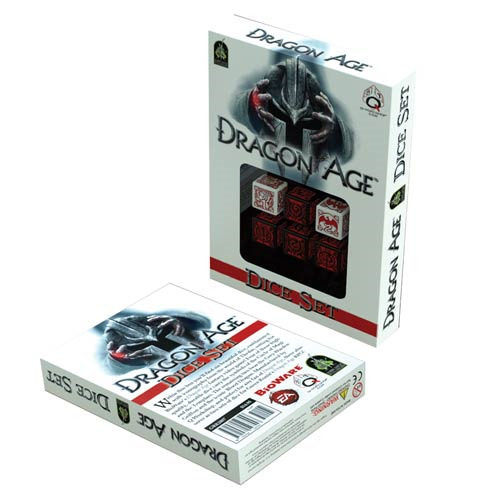 The Dragon Age Dice Set is perfect for any fan of Dragon Age, these also serve as 2 sets of dice for Green Ronin's Dragon Age? RPG! Ages 13 and up.